To be honest, I really wasn't sure if The No Meat Athlete Coobook (by Matt Frazier and Stepfanie Romine) was a cookbook for me. While I had seen people making some very nice things from it, I am hardly and athlete. The only marathons I participate in are the sort where I sit on the sofa and marathon watch a TV show. I don't need all sorts of weird athlete fuel recipes, as I am hardly burning off the same amount of calories. However, a friend who also is not an athlete said that the book was great, so I took the plunge and I am glad I did. Lots of fun recipes packed full of yummy ingredients. This book definitely is a wholefood type cookbook, no mock meats or cheeses, but it is not oil or gluten free (though there are options), and there are some tasty things. This is the first round up I have done from this book, but you can see a few recipes I have posted individually in these posts. 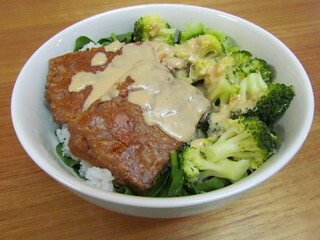 Peanut Butter Tempeh with Korean Tahini BBQ Sauce: I love peanut butter and I love tempeh, so I was excited for this. But unfortunately I found the taste of the yummy peanut sauce kind of dried out and faded once it was baked with the tempeh. The tempeh was the main flavour. I did use tempeh from the supermarket though, so I'd like to try it again with some better tempeh, and also double to sauce so it doesn't dry out so much. However, the Korean Tahini BBQ sauce definitely perked things up. With tahini, red miso, garlic (I used powdered), ginger, vinegar, and sugar (I left out the chili), it is very tasty! It thickened up nicely after blending with the immersion blender. I served this with wilted spinach, rice, and steamed broccoli. 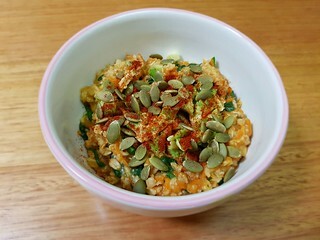 Savoury Oatmeal: There are couple of variations you can make with this recipe, so I've made it twice. 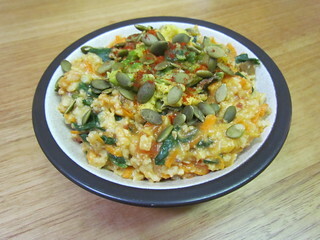 Oats, grated carrot, spinach, nooch, and sauce (either salsa or marinara) are simmered to make a nice, savoury breakfast. I found a half recipe makes a decent serve for one. Topped with smoked paprika, pumpkin seeds, and avocado. The first time I used the option with salsa as the sauce (a bottled one), and the second I used marinara (home made). Both versions were good. Buddha Bowl: I love any sort of bowl like this. There are a number of variations or alterations you can make to suit your preferences. Mine had brown rice, tofu baked in the B-Savoury Marinade recipe from the book, baby spinach, carrots, alfalfa sprouts, sauerkraut, avocado, hemp seeds, and some more of the Korean BBQ Sauce. Pineapple Black Bean Bowls with Roasted Veggies: Sweet potatoes, carrot (because I didn't have quite enough sweet potato), defrosted frozen pineapple, onion, and broccoli stems (in place of capsicum) are roasted. A tin of black beans (it was meant to be 2 cups worth, I just used one tin) is simmered with lime juice and cumin. 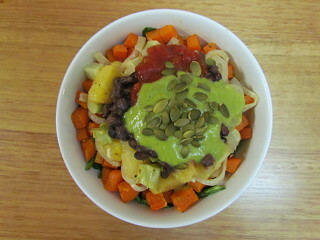 Then a bowl is made layering baby spinach (my addition), sweet potato/carrot, other vegetables, Creamy Avocado-Lime Dressing, salsa, and pepitas. Also it was meant to have plantain chips, but I didn't have any so I skipped it. The recipe says to reserve the pineapple juice from the bag of defrosted pineapple, though it didn't seem to say where to use it, so I just used it when I was simmering the black beans. I got three serves with this. Almost Instant Ramen: This recipe was so quick and very tasty. Excellent when you want a veggie-full dinner on the table fast. 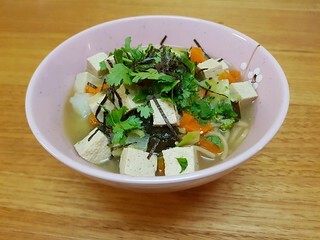 You make a quick broth using wakame, onion, and ginger before simmering vegetables and tofu and then adding ramen noodles to cook and miso at the end. I left out the kimchi and chili flakes to make it nice and mild, and I used green cabbage instead of red cabbage as that was what I had on hand. 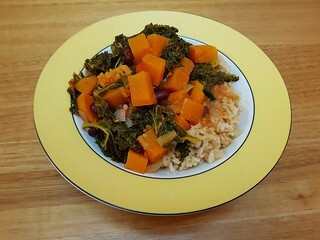 Caribbean Coconut Collars and Sweet Potatoes: Collards don't exist where I live, so I made this with kale instead. The recipe calls for one large sweet potato, and my large one was about 800g, but I don't know if that was what they had in mind. I got four big servings of this served over brown rice, and the recipe says it makes 2-4, so perhaps it was meant to be a smaller potato. However, it was quite saucy and the end, even with the large amount of sweet potato, and I simmered it to reduce a bit with the lid off at the end. Vietnamese Veggie & Rice Noodle Salad: This makes a huge salad, and is so refreshing. Excellent for hot summer days. Carrots, daikon, and cucumber are quickly pickled in sugar and vinegar, before being mixed through chilled rice noodles. The salad is topped with seared tofu, blanched bean sprouts, and avocado sauce, and peanuts. So yum! So much! A quick break from kitten spam to return to my true love, Dim Sim. Here she is in her carrier. We went to get her check up today. 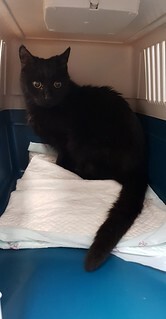 All good on physical exam (with allowances for being an almost 19 year old kitty), and we are waiting for blood results to come back from the lab. Fingers crossed for everything stable! I always check the library for that cookbook! I really need to try savory oatmeal but for whatever reason I'm so terrified! I barely like regular oatmeal! The rice noodle salad sounds right up my alley. I really love a rice noodle salad. Yay Dim Sim!! All fingers and toes are crossed over here!! 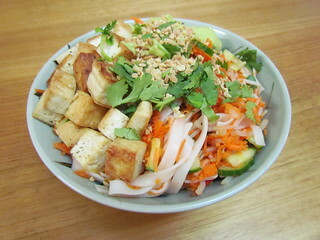 So hot at the moment, so many noodle salads for dinner! 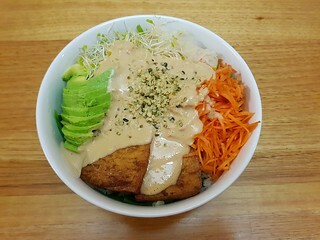 The Buddha bowl sounds great, and the ramen looks so good! Sweet, brave Dim Sim! She was so brave, even though I knew she was scared. 19 years! That is one old kitty! Bianca is definitely a fan, she was the one who really made me notice the book. Though she is very athletic!